1. Prep veggies and peach, tossing each variety separately in olive oil, salt, and pepper. You could do them all together, but they’ll have different cooking times, so that way lies disaster, I think. 2. Heat grill to around 300-ish. Our grill is old and flaky and seems to only go that high at the moment, so I’m not sure what would happen if you cooked at higher heat, sorry! 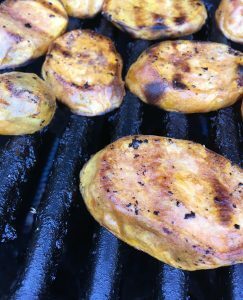 Spread out sweet potatoes in a single layer and grill 8-10 minutes, flip, cook another 8 minutes or so, until cooked through. Remove from heat. 3. 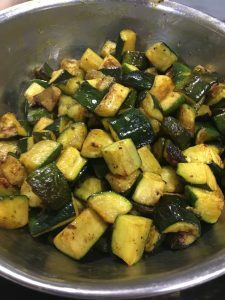 Stir turmeric in with zucchini (along with salt, pepper, olive oil), then spread zucchini cubes in a vegetable grill pan and place on heat. On other part of grill, spread out asparagus. Grill until cooked through — maybe 5-10 minutes for asparagus, a little longer for the zucchini. Keep an eye on the asparagus, as they burn easily, esp. if they’re very thin. 4. Start couscous going, following directions on box. I boiled two cups water, added a little salt and butter, dumped the box’s worth of couscous in. Add sultanas and cashews, stir, and cover for 5 minutes. 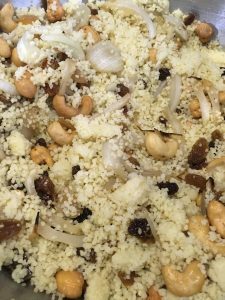 The sultanas and cashews will soften nicely while the couscous cooks. It will be even tastier if you do this in chicken broth, but I was aiming for a vegan dish this time, so stuck to water. Vegetable broth is also good if you have it on hand. 5. If the zucchini is done, remove it from the grill pan and toss the onions in there. Place the peach halves (or quarters) on the grill and cook for a few minutes, then turn, so it’s grilled all around. When onions are done, stir them into couscous. 6. When everything’s done, taste each component and toss with more salt / pepper if desired, then layer in dish to your pleasure. 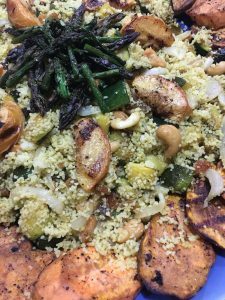 I did the sweet potato slices around the outside, then piled the couscous in, then topped with a circle of peaches and asparagus in the center. If doing again, I might add a yogurt sauce on the side, though I don’t think it strictly speaking needs it. Note: You could absolutely add grilled fish or chicken or lamb to this, of course.